Availability: In Stock., 8 Available. 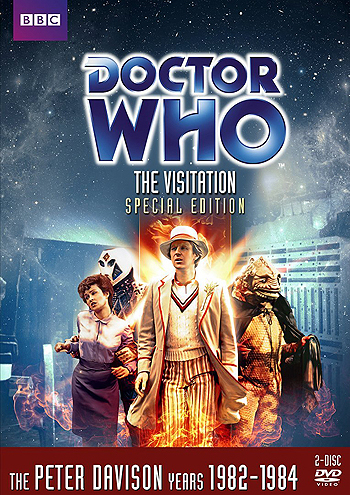 Digitally remastered Doctor Who classic The Visitation Special Edition. It's 1666, and medieval England is in the grip of the Great Plague. But when the Doctor and his companions arrive, they discover an even greater threat: the entire planet is in danger. As the Grim Reaper stalks the countryside, the Doctor uncovers an alien menace intent on wiping out humanity and claiming our planet for themselves. The Terileptils have arrived - and only the Doctor can stop them. 4 x 25 mins approx colour episodes with mono audio. Film Trims (dur. 5' 32?) - including extended / deleted scenes. Directing Who - Peter Moffatt (dur. 26' 13") - a featurette about the work of the director of this and several other Doctor Who stories. Writing a Final Visitation (dur. 12' 50") - an interview with the story's writer, Eric Saward. Scoring The Visitation (dur 16' 19") - Mark Ayres interviews composer Paddy Kingsland about his music for the story. Isolated Music - option to view the story with the isolated music score. The Television Centre of the Universe - Part One (dur. 32' 12") - Blue Peter presenter Yvette Fielding takes Peter Davison, Mark Strickson and Janet Fielding on a trip through BBC Television Centre, meeting up with old friends and colleagues as they reminisce on their time spent working in the iconic building. With film traffic supervisor Neville Withers, assistant floor manager Sue Hedden, costume designer Odile Dicks-Mireaux, production assistant Jane Ashford, make-up artists Joan Stribling and Carolyn Perry, BBC producer and writer Richard Marson. Doctor Forever - The Apocalypse Element (dur. 27' 29") - the latest instalment of our new series looks at the work of those who kept Doctor Who alive in the form of audio adventures following the TV's show's cancellation in 1989. With actors Colin Baker , William Russell and Lisa Bowerman, new series executive producer Russell T Davies, Big Finish executive producers Jason Haigh-Ellery, Nicholas Briggs and Gary Russell, Big Finish producer David Richardson, BBC range editor Steve Cole, writers Mark Gatiss, Robert Shearman, Paul Cornell, Joseph Lidster and Justin Richards, AudioGO commissioning editor Michael Stevens. Introduced by Ayesha Antoine.